There are a lot of options available to homeowners when considering adding a backsplash to a kitchen. Few have the impact visually than glass mosaic glass tiles. Tile has several advantages. Tile can add a splash of color to your walls, it is practical by providing an easy cleaning surface while remaining relatively inexpensive, in the light the tiles give either a warm or cool glow depending on the color choice, and it is fairly easy to install yourself. When choosing a tile pattern, it helps to coordinate at least one of the central tile colors with your paint color or another neutral color that coordinates. Tile comes in many shapes and styles, but the most bang for the buck is to choose 1'x1' mosaic glass tiles that are 1"x1"x1/8". These are also ideal for easy installation because the mesh on the back of the tiles provides even spacing eliminating the tedious task of placing spacers individually. The 1/8" thickness keeps the product light on the wall so adhesive tile matting can be used to hold them in place. You will need to begin by measuring the space above the countertops that will be covered calculating for total square feet. Then you will be ready to purchase materials. Using your measurements, you will be able to buy adhesive tile matting and the tiles. Also, you will also need grout with no sand, a sponge, a five-gallon bucket, glass tile nippers, utility knife, grout float, and a couple of paint stirrers. When choosing grout consider the color of the room, color of the tiles, and your cooking styles. If you cook with oil often a darker grout will help maintain the original appearance should it get dirty. 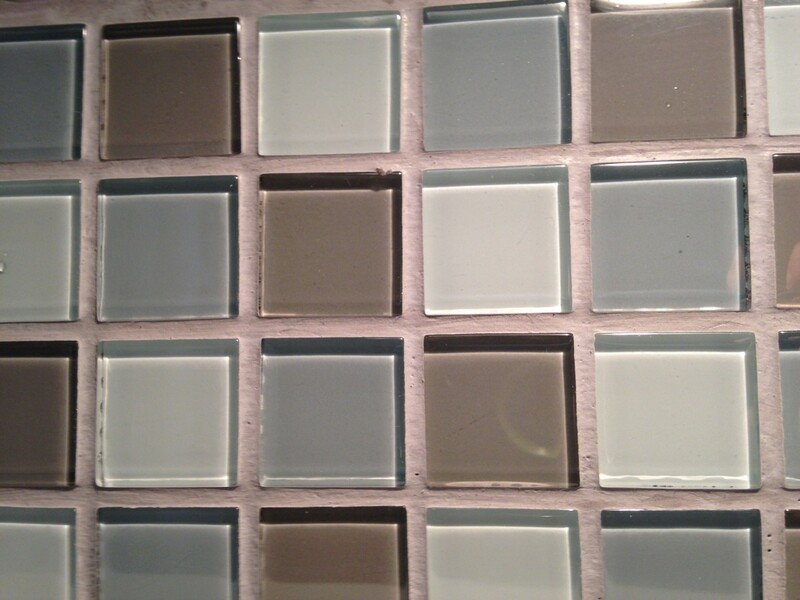 When installing glass tiles its best to use grout without sand in the mixture. Sand can scratch the tiles surface when you float the grout in between the tiles. First, you need to prep the walls by mixing water and a light detergent in your bucket. Then allow the walls to completely dry so that the contact side of the tile matting bonds well to the wall. Once the walls dry, apply the tile matting to the walls over the entire area to be covered. DO NOT remove the clear film covering the tile adhesive. 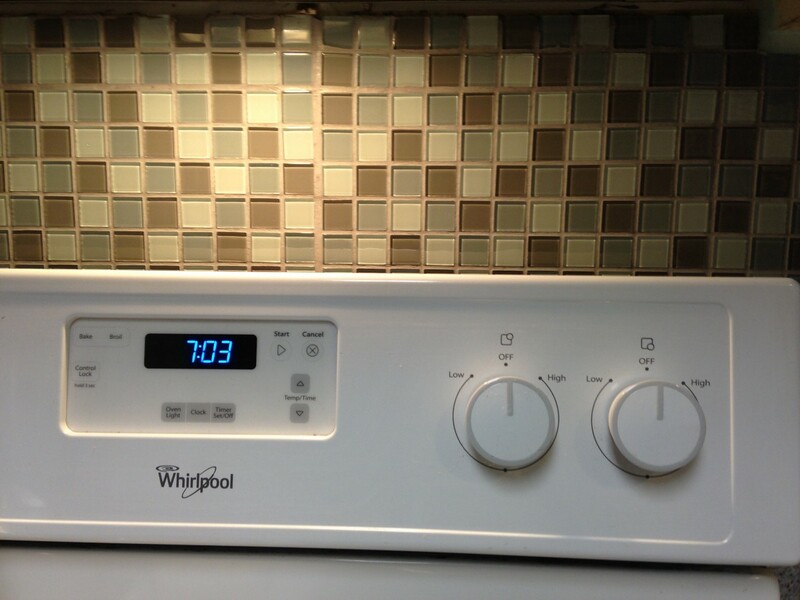 Remove the films as you go when applying the tiles. This is important because once the tiles meet the adhesive they make a solid bond. Unless your room is perfectly square, you will have to cut the tiles to go around outlets and into corners. A great trick to cutting the mesh the tiles adhered to is to stack the cardboard backings the tiles were packaged in then using the utility knife simply slice the mesh and remove the extra tiles. To cut the tiles you will need to score the glass then nip them individually with the nippers like using scissors. When the tiles are all in place on the wall, it’s time to add the grout. Mix the grout in the five-gallon bucket according to the directions then float the mixture in between the tiles using the grout float. Wipe the grout residue off the surface of the tiles as you go with a moist sponge. 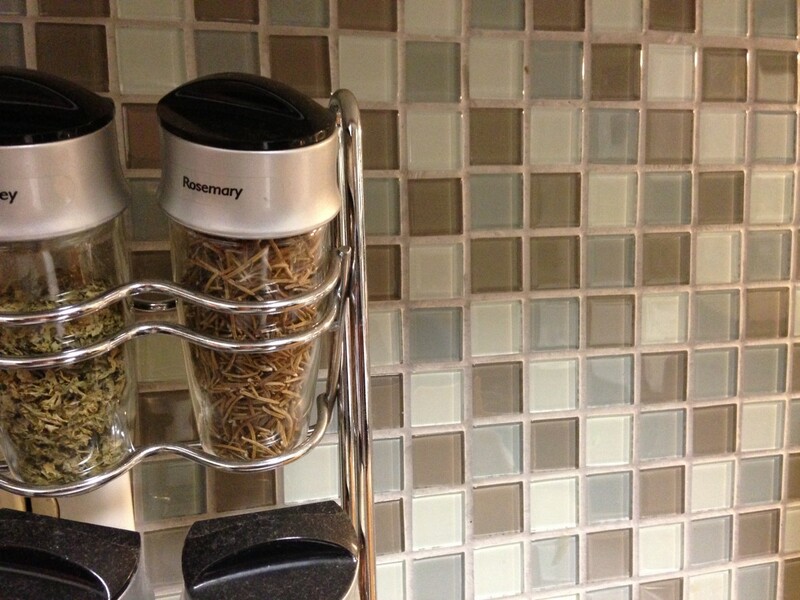 Once the grout is dry, congratulate yourself for adding beauty and value to your kitchen.